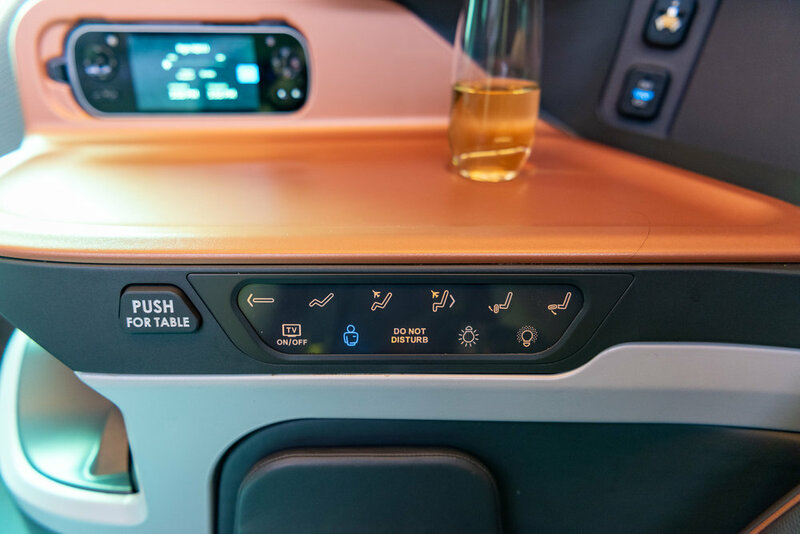 It has been slightly over a year since Singapore Airlines first revealed new cabin products on the Airbus A380-800. While most people went crazy over Suites (as you would expect), I was personally more interested in the Business Class product since that was something that I foresee myself experiencing on a more regular basis - I do not typically redeem flights in First Class or Suites since Business Class is already a very solid product (at least on Singapore Airlines). 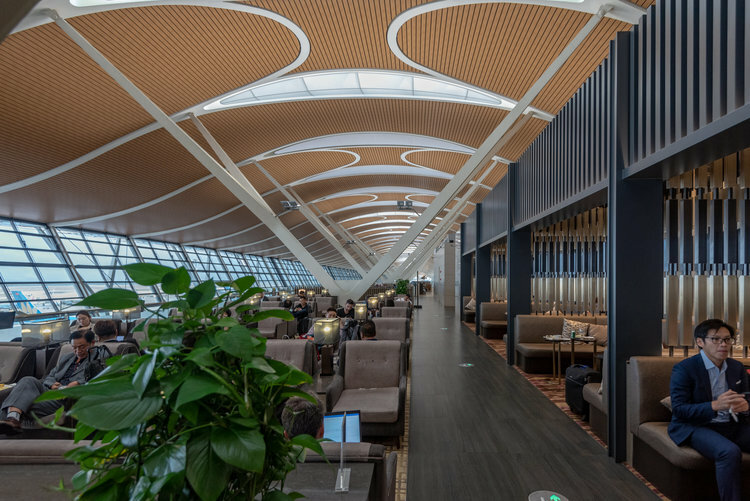 When I visited Shanghai last month, I booked myself on flight SQ833 which was operated on an Airbus A380-800 and I also managed to check out the No.77 China Eastern Plaza Premium Lounge before my flight - it is a great lounge (as far as airport lounges in China are concerned). Click HERE to compare flight prices on Skyscanner! My flight from Shanghai to Singapore was on a relatively new plane (9V-SKU) and as you would imagine, the Business Class cabin features the new cabin products. The Business Class seats have 55" of seat pitch and 30" of seat width - this is fairly similar to what the previous Business Class product on the A380-800 offers but strangely enough, I know a handful of people who actually prefer the previous product for sleeping. The Business Class seats on Singapore Airlines' A380-800 feel very private and there is plenty of space to store your personal belongings. The side table can also double as a small work desk if you wish to work on your laptop during the flight - the foldable table does a better job but I did find the table to be slightly shake-y when extended. Since there is stowage space under the seat, I decided to leave my bag there instead of putting it in the overhead compartment. Once I settled into my seat properly, I was offered a glass of Champagne (on the ground) which I politely accepted. 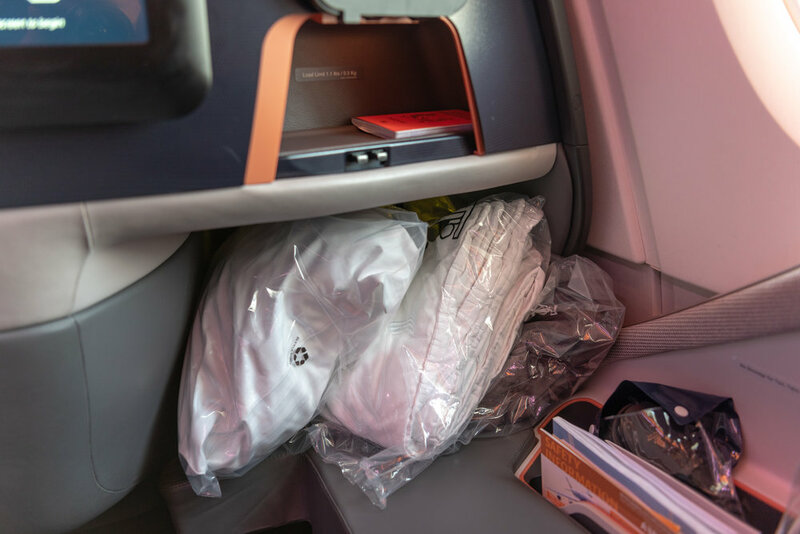 There is a small compartment in front of your seat next to the IFE screen to store small personal effects like your passport, wallet and mobile phone. You might notice that the location of this space is different for seats in the middle row. If you wish to close it, all you have to do is to flip the top part of the compartment down and it flushes in nicely once it is closed. There is also a small coat hook located above this compartment but honestly, if you are traveling on Singapore Airlines, one of the cabin crew will probably grab your coat (or jacket) when you settle into your seat so this coat hook is essentially useless (in a good way!). Despite being only a short 5-hour flight from Shanghai to Singapore, bedding, blanket as well as an extra pillow are all provided. These are placed in the foot rest area of the seat so you can easily convert your seat into a lie-flat bed anytime during the flight - you are also not required to flip over the seat anymore since it reclines directly into a lie-flat bed (hurrah!). There is a small reading light that you can adjust by your seat but what I like most is the ambient light next to it - apparently the design is inspired by a deconstructing the Singapore Airlines logo but I am not 100% sure that that is in fact, the truth (or simply #FakeNews). There is a button on the seat control panel that will toggle this light on and off and I will mention this in a few paragraphs below - the same button will also toggle the light in your foot rest. Each one of these Business Class seats also come with a flip-out mirror (with an inbuilt light!) on the side so you look your best even after a nap. There is also a IFE handset located underneath the mirror - these touch-sensitive handsets are uniform across Class, Premium Economy and Economy Class. The IFE screen is also touch-sensitive so there is actually very little reason to use the handset but hey it is all up to you! As you would expect, every single one of these Business Class seats come with a USB charging port where you will be able to charge your mobile devices. I like how the entire product feels well thought out - the design and location of these features make sense. For instance, the USB charging port is located right next to the seat so you do not really have to worry about the cable getting caught or your phone dropping when you are standing up. The USB charging ports on some aircraft are located next to the IFE screen which means that the cable actually run across your seat if you are actively using it. Singapore Airlines actually provide complimentary WiFi for Business Class passengers (30MB per sector) on selected flights. If you are a PPS Solitaire member, you will receive 100MB per eligible flight segment regardless of cabin class. The seat controls are located under the side table and they are also touch-sensitive. These 'buttons' do provide haptic feedback but they do require a little more effort to push - you will have to press and hold instead of lightly pushing it in a staccato motion. The rationale behind this is to avoid any accidental brushes and button pushes during the flight. On the bottom right hand corner of the panel is where you will find the button for the ambient light that I have mentioned above. Business Class on Singapore Airlines A380-800 features an 18-inch IFE screen which is great for movies during the flight. The new KrisWorld entertainment system also allows a passenger to pick-up exactly where he or she has left off (as long as you 'login' with your KrisFlyer membership number). What this means is that you can essentially continue a movie or show that you were unable to finish on your previous flight so long that data is synced - this feature is especially great for me since I typically do not finish movies in one flight and not having to search for that point where I have left off helps immensely. The only thing I wish is for them to incorporate a 'Smart Pause' equivalent on the plane since most of us actually drift off to sleep while watching a movie and it would be good for products in the future to incorporate this. The typical noise-cancelling headphones on Singapore Airlines are also provided on this flight and even though I do generally travel with my own pair of headphones, I do appreciate the ones provided in-flight as they are infinitely better than what Qantas offers in Business Class. Back in July 2018, Singapore Airlines rolled out a brand new Chinese dining concept for selected flights between Singapore and Beijing, Shanghai, Guangzhou and Hong Kong for passengers seated in Business Class. These new three-course menus, known as Shi Quan Wei Mei (食全味美) are built upon the famous Shi Quan Shi Mei (十全食美) menus that are already available to Suites and First Class passengers on selected flights between Singapore and China. Since I have not had the opportunity to try it previously, I decided that this would be the perfect chance to jump in on this dining concept but honestly, it left me unimpressed. Even though I opted for the Shi Quan Wei Mei menu, I was also being served the Singapore Chicken and Lamb Satay with onions, cucumber and spicy peanut sauce. The first course of the Shi Quan Wei Mei menu is a Chili Pork and Asparagus Roll that is served with a three-colour steamed egg. Now most of us who live in Singapore must be familiar with the 三蛋菜 (tri-coloured egg) which is commonly served in eateries - this dish is typically served with spinach in a delicious broth. The one offered in-flight is served in some kind of terrine and this cold appetiser was lightly seasoned which to me takes out the comfort that is typically associated with this dish. Some vinegar-pickled peanuts were also served on the side but they did not taste particularly good. The second course is the main course and unlike the Western menu, you do not get a choice of main course with Shi Quan Wei Mei. The Steamed Seabass with Roasted Garlic Sauce was served with Wawa Cabbage and Steamed Rice - even though it did not look appetising, the flavours were actually really good and this dish was the best one amongst everything else that I have eaten on the flight. The fish was done beautifully and that roasted garlic sauce packed intense flavours that helped to bring that contrast between the natural sweetness of the fish and wawa cabbage. Unfortunately, the final course (dessert) was a disaster in my opinion. The Chilled Glutinous Rice Soup with Dried Longan tastes terrible and honestly, I have not had a dish like that prior to this flight. The closest thing that I have ever had is probably pulut hitam but that is actually delicious. I did not bother with this course at all and I actually had food envy from everyone else's Western meals (which is always a good choice on SQ). Upon the conclusion of meal service, coffee and tea was offered and I opted for a Vanilla Bourbon Tea to wash down that gross aftertaste of the Chilled Glutinous Rice Soup with Dried Longan. I always feel a little bad asking for a special tea (since they already have brewed coffee and black tea prepared) but hey I really wanted a VBT. 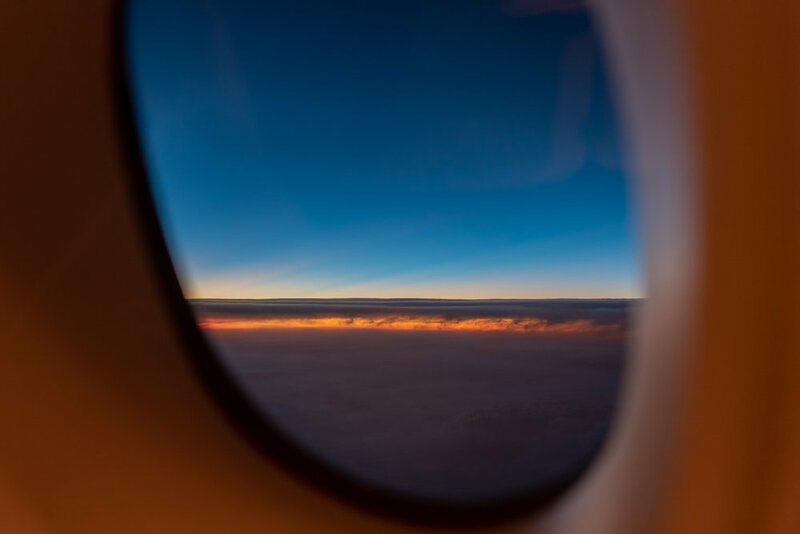 Apart from the erroneous decision to go with Shi Quan Wei Mei, the Singapore Airlines flight from Shanghai to Singapore was every bit as good as I have expected. While it was not as spectacular as the flight from Singapore to Shanghai where the crew actually surprised me with a birthday cake, the flight experience was great! Despite the 30-minute delay in taking off, the flight actually arrived in Singapore 13 minutes ahead of schedule and it is always nice to return home knowing that clearing customs and picking up your checked baggage can potentially take under 15 minutes depending on where your gate is.